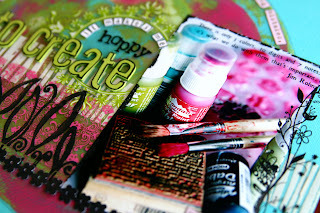 LOVED the "messy" scrapping I did on saturday so I had another play with paint yesterday! So I mixed a few colors of acrylic paint on a piece of transparant film, put a piece of cardstock on top of it and rubbed it. Tried it a few times and when I was done I had some pieces of cardstock wit a fun print but I also had this piece of plastic with the left paint. And that one I liked most of all! 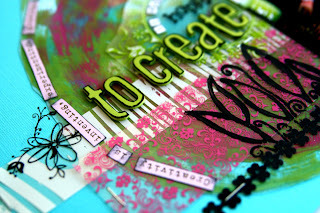 Si I decided to cut it out and just staple it on my cardstock to use as a background. And again no patterned paper, just some Hambly. Text around the circle sais: Creativity is inventing, experimenting, growing, taking risks, breaking rules, making mistakes and having fun - Mary Lou Cook. It's monday... a week full of possibilities to create lies ahead! Have a great one!! wow- this is so cool- i think i´ve to try it on my own! Ook deze lo is GAAF!!! You are just too creative!!!! WOW!!! Wow, this one is soooo cool, just like the one before! Love them! keep 'm coming girl, you are ON A ROLL big time. this is pure eye candy. totally love it! the colors, design, every thing you put on there is just perfect. we need to go create together LOL. Wow, I love this, awesome, looks so cool!!! Are you going Freestyle??? 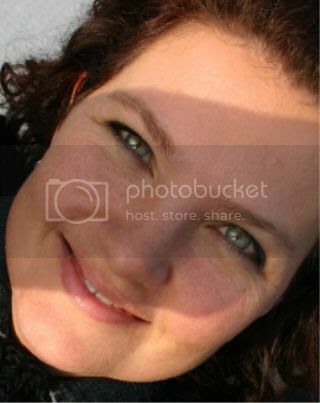 Birgit, it is amazing, you can scrap every style. Totally love what you did with Nat's technique, it looks fantastic! Geweldig!! Wat een gave lo, helemaal top!! Ook dit is weer een erg mooie LO geworden. Wel iets totaal anders, dan ik van je gewend ben. Maar ZEKER niet minder mooi(!) Geweldig. Wow love this, so much color!! Ik vind hem ook helemaal super zeg!!! Zoals ik al zei op SIS: je pagina is weer schitterend. Ik heb dit weekend ook geëxperimenteerd met verf en het is me super bevallen. Zo anders maar een waanzinnig mooie layout. 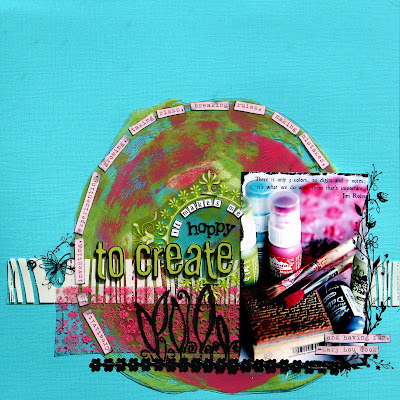 Wow, love the freestyle mixed media look af this layout! O, that is so cool. Gorgeous !!! Love the colors !!! LOVE all your *mistakes and broken rules*!!! have a good one!! hugs!! Great Lo!!! I love your job!!! !